Discussion in 'The Lounge' started by Quo Fan, Feb 6, 2013. Up early because I have to be onsite at 7am. Weekend was too busy and too short. I have 6 days left on this rotation. Helllllooooooo, MONKEYS! Knee recovery begins today. Thanks to everyone who offered kind words yesterday, and to all those who didn't, well HMPH. My stupid god#$% CO2 sensors chirping all over the house this morning, waking me up thinking there is a problem but it's only the batteries needing to be replaced. So I go around, pull all of them, only to find it's the stupid god@#$% smoke detector up in the vaulted ceiling for which I have no ladder to reach. Stoney has an SB and Full Trucker has the plastic, er 'C' version, they're very dialed frames. Consider these my kind words! Are you back to work today? LOL no. Not until the 19th, and then for two more weeks it'll be half days or whatever my discomfort threshold is. That said, the first thing I did this morning after working my way out of bed was check and reply to some work e-mail. I am in a fair bit of pain today. Good times. Morning monkeys. Another Wednesday, another inch of annoying snow, another forecast of a blizzard of catastrophic proportions. Pass the coffee please! Are you going to be tied to one of those knee bending machines? kind words such as feel better and hope you don't hurt too much. Wednesday. Gah. Two small jobs I can likely finish before lunch. Hopefully I do and after lunch I can slack off again. Left my lunch and phone charger at home. So I have to go out to eat again today. Piss me off. Oh well. Nick, my smoke detector did that the other day, my solution was to rip it off the wall and yank the battery, problem solved. No machine...I'll just have home physical therapy to do a few times a day for 6-9 months, some it involving the use of a strap. the one that is made of metal. I had one of those knee-bendy machines for a while. They sure were uptight about that thing. Seemed like I got a call every 2nd or 3rd day wanting to know if I still had it and if they could come pick it up. Like I was going to sell it on craigslist or some sh*t.
'Squeeb, I meant to comment your half marathon. An 8 minute PR is no joke. I know you said you weren't thrilled with it, but shaving 36 seconds off your pace is huge. You've knocked more off your HM time in one attempt than I have in six attempts. I've only gotten mine down by about four minutes since my debut. I've actually knocked more time off my 5K. Just keep at it and you'll continue to improve. Thanks IAB! In my head I know it's a big improvement, I guess what was most discouraging is just knowing that I had run the exact course faster in a training run. Not sure what happened. The course was super crowded, 500+ people on a small town greenway, so I don't think that helped, but I was gassed when it was over too so it's not like I had much more to give. Win some, lose some I guess. Still, I'm pretty fast for a dead guy. Oh hia monkeys!!!! I spend the weekend in Ithaca Ny enjoying my first weekend out of school, was a good time to say the least...... don&#8217;t remember much of it. Anyhow, home for a little while and I need to find a temporary full time job to make enough for the race season and to move out. I would take the one that is the lightest. Good luck with your recovery, IAB. I suppose I should head into work and clock in&#8230; Late night with the baby what with feeding and diaper changing and such, something I should get used to. At work. Wifey got contracts for a bunch of business that she put in proposals for almost 6 months ago. She now has more business than she can handle. This is good and bad though. We will need to put Haley into daycare 3-days per week now, which we really didn't want to do. Thankfully it's with our next door neighbor, so Sarah can drop by for lunch with her. Otherwise, nothing new. DaPeach - I really like my SB66. Going back, I would have preferred to get the C, but I just couldn't justify the additional cost over the Al. It handles downhill like a DH bike, but still pedals great. I know that sounds cliche', but I have been really impressed by it. 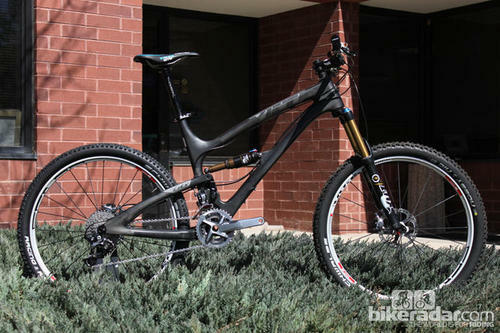 If I were to change anything, I would have gotten the carbon and have a fork w/ adjustible travel. The fork just so that I can get better DH angles without blowing up my climbing. Not necessary, but a nice to have. I'm currently running a 36 at 150mm. Twice in the past 2 weeks I've ordered things online, and both showed up with small bits missing. People wonder why I hate ordering online. But I see what you did there. Morning! Glad you survived surgery! Now take your happy pills and get better IAB! I've come up with an idea of what I want to do with the rest of my life (work wise), and now I plan to implement it! Slow and steady wins the race. Hopefully I can find another job to replace the current income while I build business for teh big idea! You sound pissed. No wonder you texted me asking about a ladder. I checked again, still don't have one. Stoney, sent you an emails RE: work stuff. DaPeach: SB66C Stoney has an SB and Full Trucker has the plastic, er 'C' version, they're very dialed frames. tubes socks and super glue > beer cans Every.Single.Time. I've got a buddy with an aluminum Covert, and he loves the ever living crap out of that thing. I keep meaning to swap bikes with him for a ride, but don't count on that sort of comparative analysis anytime soon, at least not from me. It is, after all, snowing moar regularly. Cue the Johnny Cash, I'm off to Jackson Hole in ~32 hours. Yeah, the Yeti def gets a lot of love 'round the interwebs. Not much to be read about the Covert. I'm trying to set up a demo at one of my LBSs. I'm willing to drop a couple of bucks for some test ride time. I will continue to bore you all with this decision making process over the next many months.